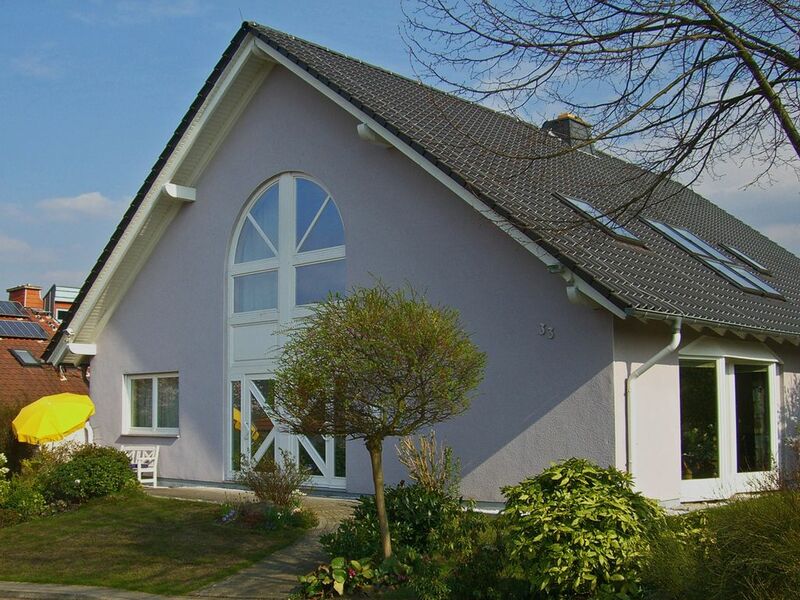 The conditionally barrier-free, comfortable, light-filled, quiet ground floor apartment is located on the outskirts of Fuldabrück, OT Dennhausen in the countryside. The apartment is completely tiled (incl. Terrace), only in the bedroom is carpet. Underfloor heating u. electric blinds, washing machine, a modern kitchen with ceramic hob, microwave and dishwasher complete the comfort features. Bed linen (beds are made) and towels are of course included. A private 20 sqm covered terrace with comfortable garden furniture u. Nature view, as well as garden u. Grill use available. A private parking space is available and bicycle parking spaces in the garage possible. (A travel cot is also available.) This can be made available on request. From our apartment you can in about 10-20 minutes in many venues (eg. For concerts in the Auestadion / Eissporthalle, at the main station (Kulturbahnhof) in Kassel, in the Karlsaue, Fridericianum, documenta-Halle, Hessenkampfbahn for the sports festival , the Neue Galerie, Staatstheater, Messehallen / BuGa grounds, etc ...). Rich variety can be found in our UNESCO World Heritage Site - Europe's largest mountain park Wilhelmshöhe with Hercules and the illuminated water features. Special experiences promise the different tours with GPS. Geo-caching friends will find many different ways to explore our beautiful surroundings. The Fulda Radwanderweg R1 leads in the immediate vicinity of the house and invites you to bike or. Inline tours to Kassel or the beautiful half-timbered towns Melsungen, Fritzlar, Rotenburg u. Hann. Münden. The way home can be done by train, as the train stations Guxhagen and Baunatal-Rengershausen are close. All hiking, jogging, Nordic walking inliners - u. Geo-cachingtouren (short: with and without GPS) can also start directly at the house. Tip: the 'Kassel-Steig' is a unique, demanding and environmentally friendly panoramic hiking trail (about 157 km / about 70 viewpoints / 3008 m difference in altitude) around the Kassel basin with views of the city of Kassel, panoramic views of the Kassel basin and Wide views of the region. All start or end points can be easily reached by public transport. Horse-u. Water sports are also practicable in the immediate vicinity. Kassel and the surrounding area, with their cultural programs, the museums of Kassel, concerts, sports events (handball MT Melsungen-1 Bundesliga, ice hockey, horseback riding etc ...) and many other events rich variety. Tierpark Sababurg with Dörnrschenschloss - Edersee with animal park and castle Waldeck- Many special events lure. In about 45 minutes you are from our apartment on the Sababurg or on the Edersee and then can enjoy all sights and events in peace. High quality, high standards, comfortable, superb location and to top it all a friendly caring host. We have stayed in several ferienwohnungs over many years and this one has to be at the top of them all. The location was in a small quiet village but within easy (five minute drive) access of nearby villages with full facilities. It was also so easy to get to some beautiful villages, towns and spa towns. There was plenty of designated well signed cycle and walking routes that were well used by people visiting the area. You could stay for a week and need to return for another week as there's so much to see and experience. The quality of the accommodation was superb. It was spacious, spotlessly clean with high quality furnishings and equipment. It had a private garden with your own garden furniture to use. The owner was friendly but not intrusive. Her English was good, she and her husband made us feel very welcome. We obviously would stay here again and would recommend it to all of our friends. De woning is zeer compleet en alles is tot in de puntjes verzorgd. Vanuit Fuldabrück kun je veel kanten op: Kassel, Edersee, Fritzlar enz. In de woning is veel informatie voorhanden om diverse uitstapjes te maken. De ontvangst was vriendelijk en correct. Wij hebben een heerlijke week gehad. sehr schöne Ferienwohnung, ideal zum erkunden von Kassel und Umgebung. Sehr nette Gastgeber, es hat an nichts gefehlt. Tolle Wohnung am Waldrand.Super gemütlich eingerichtet.Alles da was das Herz begehrt. Die Wohnung ist gut und praktisch eingerichtet. Die Küche ist komplett mit allen Geräten ausgestattet. Im Wohnzimmer gibt es außer einem Fernsehen mit DVD-Player, ein Radio, Kassettenrecorder, CD-Player, WLan-Anschluss. Die Eigentümer wohnen direkt nebenan und achten sehr auf Ordnung und Sauberkeit. Idyllic & tranquil setting located location location GrimmHeimat Northern Hesse on a Fuldaschleife right on the bike path in R1 - fairy tale land (about 0.2 miles away from the house). Ideally located in the heart of Germany. Southern edge of the Brothers Grimm and the Documenta Kassel. Good starting point for hiking, inliner, hiking, Nordic walking, GPS & canoeing. Highly recommended is a visit to the World Heritage Site in 2013 - the mountain park Kassel-Wilhelmshöhe with lock, Hercules with water features. Many museums, events in the Kassel Karlsaue with orangery, seven mountains, exhibition halls, Auestadion are well u. To reach. Central access to the A7 motorway, 44 & 49 (Kassel cross). Local bus (0.4 km) and train connection (Baunatal Rengeshausen 1.5 km). ICE station Kassel-Wilhelmshöhe about 12 km. Proximity to Baunatal (VW factory), Niestetal (SMA), the half-timbered towns Hann. Munden, Fritzlar, Rotenburg, Melsungen (B. Braun), Sleeping Beauty Castle Sababurg and Waldeck.